← The Quest for Mr. Right – Chap. 3: What’s my dating personality? I am not a *fan* of my #crazyneighbor. My room mate and I live in an apartment complex that is three stories tall, with about 12 units in it. We are on the top floor, with neighbors next to us and below us. This means that we can’t start the dishwasher before going to bed at night in order to use electricity during off-peak hours, reducing strain on the grid and saving us money. It also means that I can not get up in the morning before work and fluff any clothes in my dryer to remove wrinkles; consequently, I also have about 4-5 hours after getting home from work to do any and all laundry (that’s maybe 2-3 loads and usually one doesn’t end up getting dry in time) before the curfew. Artist's rendition of our grumpy downstairs neighbor. Not too long after we moved in, our neighbor gave us a friendly reminder that our appliances were running past the curfew, till maybe 10:15 or 10:30 p.m. at the latest. We tried to be more cognizant of the time, but sometimes you only have 10-15 minutes left till a load is done in the dryer, or the dishwasher takes a little longer than you expect. He also notified the apartment manager about this, so she called to give us a friendly reminder. Apparently what set him off was the garbage disposal used one night past 10 p.m. He lodged a formal complaint and we received an official warning from the manager, denoting which section of the community guidelines we had violated. I called the apartment manager and talked to her about the issue, explaining that the appliances had only been ran *occasionally* to maybe 10:15 or 10:30 at the latest, and that as of late, the only thing we had used past 10 p.m. was the garbage disposal. She explained that he had made it out to be worse, that this was a recurring nightly infraction; so, after agreeing that the this seemed pretty extreme, and me offering to give him my number should any future issues occur, the manager thought we were at a good place. So did I. Boy was I was wrong. The neighbor came upstairs and knocked on our apartment door while I was in the shower, so my room mate answered it. He informed my room mate that he could hear some kind of a buzzing sound coming from our apartment, and more specifically, from my room. My room mate said he’d talk to me when I got out of the shower and we’d get back to him. After getting dressed, I went downstairs to talk to my neighbor. He invited me in to listen for the sound…the fan in my room was on at the time. I couldn’t hear anything. I asked him if it was perhaps either the air conditioner which we had been running earlier, or perhaps the exhaust fan in my bathroom. He said he was pretty sure it was neither. So, after going upstairs and turning everything off, I asked him if he could still hear the sound, and he said yes. I still couldn’t hear anything. Conceding, at the time, that it could by some odd chance actually be the fan in my bedroom, I accepted his offer to give me some bubble wrap and styrofoam padding to place under the base of my fan. This would make for a lovely addition to my brand new fan in my bedroom. Classy indeed. 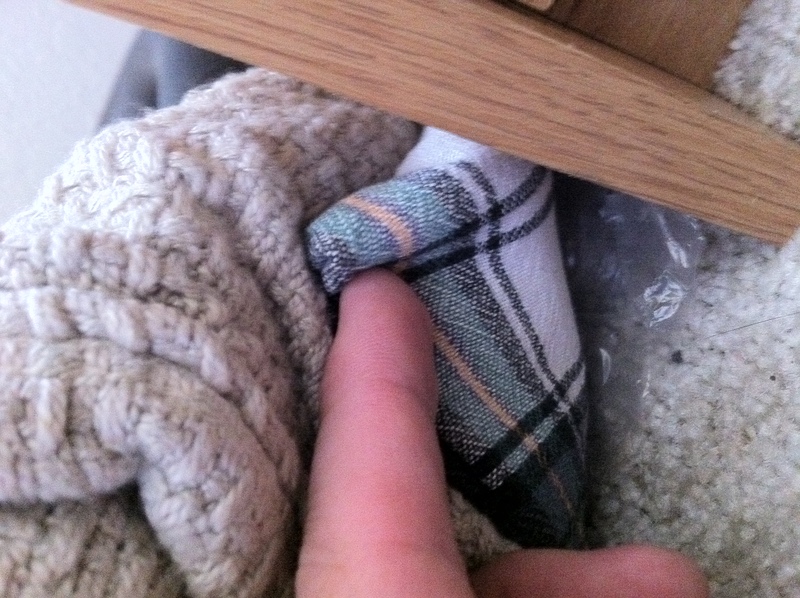 I receive the following text: “Did the bubble wrap give out?” What? Are you kidding me? 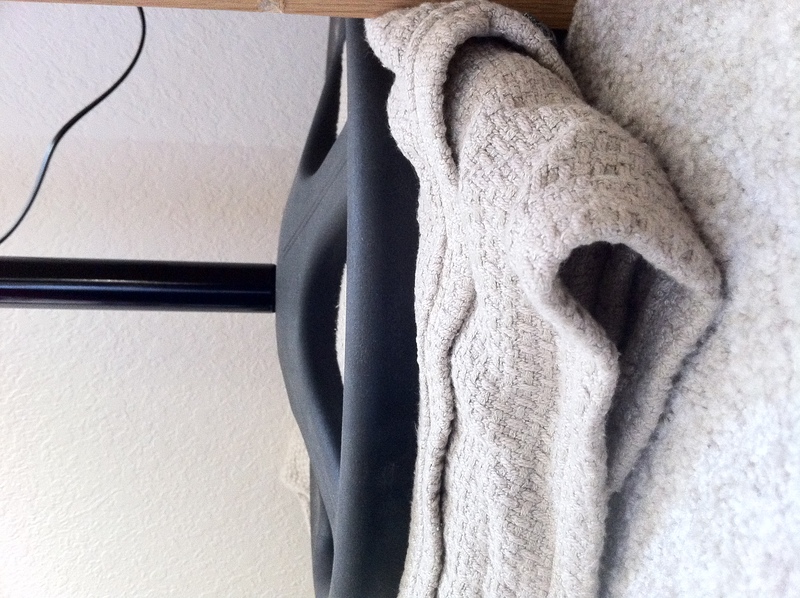 So I grabbed a blanket and placed it underneath the base of the stand, on top of the bubble wrap. I asked him if that worked and he replied, “Yes, but its not coming from the bedroom. I’ve [g]ot some styrofoam. Should I bring it up?” I told him I’d turn off the a/c to see if that was it. His reply, “yes and that’s a shame because you need your air. It sounded like it was coming from the dining room. Not from the air or the bedroom. But it’s gone now. That’s weird the air is never been a problem.” I also turned off my room mate’s fan, then turned it back on to see if perhaps that’s what he had been hearing. That wasn’t it. So he had me turn my a/c back on. That wasn’t it either. So to recap, we only had on my fan, his bathroom fan and the a/c. I also noted that I had been watching a movie; he said that was definitely not it. In fact, he said, “thanks again and sorry for being a pain, but the vibration was the loudest yet. No, I’m watching a movie too. A loud one. And no, it wasn’t my movie I was hearing.” The sound was apparently completely gone now (again). He noted that the folks upstairs had left the a/c on most of the summer before and it was never a problem. I suggested that perhaps there was a vibration elsewhere in the building that he was hearing. His response, and I quote, “there’s all sorts of vibrations. This is a cheap construction job. This is a sub-sonic one that is new and weird. First time in 6 years?” Apparently this sound he’s been hearing is subsonic and it’s the first time he’s heard it in six years at this apartment–hmmm…a sign of getting older perhaps? “Hi Lance, can I ask you to ‘fluff up’ your fan blanket a little? The buzz is coming through again. Thanks!” Yes, one month later, after I thought perhaps the issue had been resolved, the fan made it’s way back into his auditory range. So what did I do? I set it on top of the dresser. 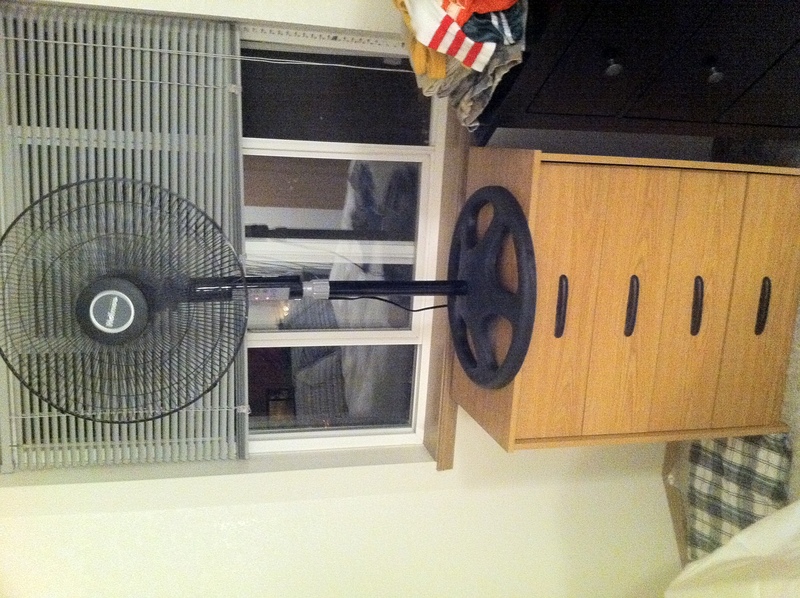 My fan on top of the dresser. Note the blanket (with bubble wrap and styrofoam below) to the left on the floor. He asked if I was freezing (the weather had turned cooler), but I told him that I like fresh air to come in because we generally lock up the apartment during the day to keep the warmer air out. Also, I enjoy the ambient noise the fan makes when I sleep. I’d like to point out, it’s a very low, light ambient noise, as the fan is on the lowest setting possible. The next morning, “I hate to say this but the new location actually made it worse, or seemed to. I was up & down all night.” I was at work, so I offered to add more blankets and try a different location when I got home. He said the blanket had worked great until the last week or so. So, I added a really thick blanket underneath and ensured that the base of the fan was not touching the sides of the walls at all. This seemed to do the trick. 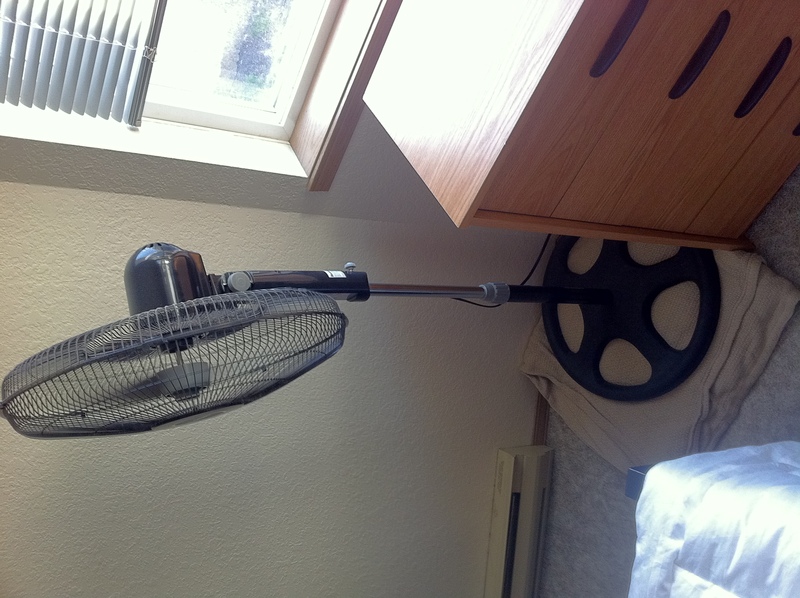 The fan with an extra thick blanket underneath (and all prior blankets, bubble wrap and styrofoam as well). Close up of the base of the stand. All of the padding underneath the fan. 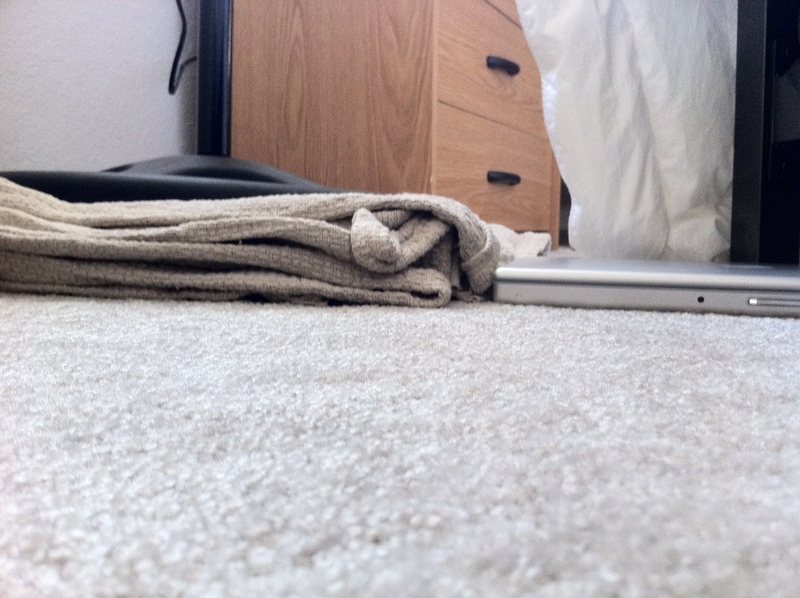 Visual comparison of the padding vs. my MacBook Pro. Here’s the kicker…my fan has been off since Sunday morning. So I responded, “Well that’s the thing: mine has been off. Since [Sunday] morning…I turned if off when I left (no use running a fan in a room I won’t be in for 10 days).” I think this caught him off guard. Maybe just a little, “Oh wow. I don’t even know what to say…I can hear [your room mate’s] when I’m in my office (his office is below my room mate’s bedroom) but have never cared cause I don’t sleep there but it couldn’t be that strong, could it?” Well, probably not unless my room mate acquired the turbine from a Harrier jet while I was gone. So he adds this, “Are you sure yours is still off? It’s only become an issue again since I’ve started closing my windows at night from the cold. Should I talk to [your room mate]?” So I called my room mate, and verified that 1) the fan was off and 2) he had not turned it on at all. I explained, “So if you’ve heard something since Saturday, it can’t be something of ours, or it’s something out of our control…there’s nothing on in my room. I highly doubt that you’d be able to hear his fan (both are brand new fans, same style).” And at this point, I am pretty much just fed up with the whole situation. I’m tired of the text messages. I’m tired of the nit picking. I’m tired of being so overly nice and accommodating. So I figure, let’s find a way to settle this one and for all, and offer this, “If you’d like, I can call [the apartment manager] and set up a mutually beneficial time for when I return, and have her listen for the sounds, using a process of elimination as we turn the individual electronics on/off?” Whether this is a good thing or not, he agreed, “That’s probably a great idea, at least I’d know if it’s in my head. Which is an even scarier thought…” I hate to tell you this, and I’m not a doctor, but I think it is. He went on to ask if we had ever heard any kind of hum in the background, like a big a/c unit in the distance. Of course, neither of us have noticed anything like that. So stay tuned for Episode 6 – My downstairs neighbor gets committed to Eastern Washington State Hospital. This entry was posted in #crazyneighbor. Bookmark the permalink. 8 Responses to I am not a *fan* of my #crazyneighbor. I hear the Twilight theme playing…I can’t believe you have been so accommodating. I know I shouldn’t be laughing at this, but I am…..won’t you be my neighbor? Hopefully this will all get sorted out. I fear he may have a tumor. You officially win “Most Accomodating Neighbor” of the year. That’s just ridiculous. It reminds me of the guys who spend hundreds isolating any squeak or rattle in their car, obsessing over every noise and never being happy with it. There’s always some new noise. It’s an apartment. People live there. There’s probably more noise from passing traffic in the parking lot. You know what, Michael, you’re right…we constantly hear cars drive by that have really loud mufflers, or giant trucks that are driven by (assuming) short guys with self-image issues, and sometimes even loud crazy neighbors across the street. Those sounds are all significantly louder than the fan in my bedroom. Yet he isn’t out on his balcony yelling at every passerby. You’ve been overly nice, have you been letting your landlord know of EVERYTHING you’ve done to accommodate your downstairs neighbor? I feel like even though he is just trying to figure out where the noise is coming from, it’s starting to border on harassment of you and your roommate. That’s actually part of the reason I blogged this…so I’d have all of my thoughts and interactions down somewhere to refer to when I talk to the landlord. But no, I haven’t been in touch with the landlord about any of the fan-related incidents. And she’s not aware of the details about the earlier incidents, as she wasn’t the manager at the time those occurred.